"Soundproof" and "rWAR" redirect here. For the band, see Soundproof (band). For the baseball statistic, see Wins above replacement. 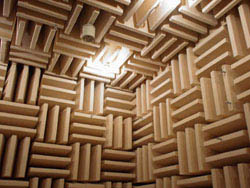 An anechoic chamber, showing acoustic damping tiles used for sound absorption. The energy density of sound waves decreases as they spread out, so that increasing the distance between the receiver and source results in a progressively lesser intensity of sound at the receiver. In a normal three-dimensional setting, with a point source and point receptor, the intensity of sound waves will be attenuated according to the inverse square of the distance from the source. Damping means to reduce resonance in the room, by absorption or redirection (reflection or diffusion). Absorption will reduce the overall sound level, whereas redirection makes unwanted sound harmless or even beneficial by reducing coherence. Damping can reduce the acoustic resonance in the air, or mechanical resonance in the structure of the room itself or things in the room. Porous absorbers, typically open cell rubber foams or melamine sponges, absorb noise by friction within the cell structure. Porous open cell foams are highly effective noise absorbers across a broad range of medium-high frequencies. Performance can be less impressive at lower frequencies. Resonant panels, Helmholtz resonators and other resonant absorbers work by damping a sound wave as they reflect it. Unlike porous absorbers, resonant absorbers are most effective at low-medium frequencies and the absorption of resonant absorbers is always matched to a narrow frequency range. When sound waves hit a medium, the reflection of that sound is dependent on dissimilarity of the surfaces it comes in contact with. Sound hitting a concrete surface will result in a much different reflection than if sound were to hit a softer medium such as fiberglass. In an outdoor environment such as highway engineering, embankments or panelling are often used to reflect sound upwards into the sky. If a specular reflection from a hard flat surface is giving a problematic echo then an acoustic diffuser may be applied to the surface. It will scatter sound in all directions. This is effective to eliminate pockets of noise in a room. A room within a room (RWAR) is one method of isolating sound and preventing it from transmitting to the outside world where it may be undesirable. Most vibration / sound transfer from a room to the outside occurs through mechanical means. The vibration passes directly through the brick, woodwork and other solid structural elements. When it meets with an element such as a wall, ceiling, floor or window, which acts as a sounding board, the vibration is amplified and heard in the second space. A mechanical transmission is much faster, more efficient and may be more readily amplified than an airborne transmission of the same initial strength. The use of acoustic foam and other absorbent means is less effective against this transmitted vibration. The user is advised to break the connection between the room that contains the noise source and the outside world. This is called acoustic decoupling. Ideal decoupling involves eliminating vibration transfer in both solid materials and in the air, so air-flow into the room is often controlled. This has safety implications: inside decoupled space, proper ventilation must be assured, and gas heaters cannot be used. Noise cancellation generators for active noise control are a relatively modern innovation. A microphone is used to pick up the sound that is then analyzed by a computer; then, sound waves with opposite polarity (180° phase at all frequencies) are output through a speaker, causing destructive interference and cancelling much of the noise. Residential soundproofing aims to decrease or eliminate the effects of exterior noise. The main focus of residential soundproofing in existing structures is the windows and doors. Solid wood doors are a better sound barrier than hollow doors. Curtains can be used to dampen sound, either through use of heavy materials, or through the use of air chambers known as honeycombs. Single-, double- and triple-honeycomb designs achieve relatively greater degrees of sound damping. The primary soundproofing limit of curtains is the lack of a seal at the edge of the curtain, although this may be alleviated with the use of sealing features, such as hook and loop fastener, adhesive, magnets, or other materials. Thickness of glass will play a role when diagnosing sound leakage. Double-pane windows achieve somewhat greater sound damping than single-pane windows when well sealed into the opening of the window frame and wall. Significant noise reduction can also be achieved by installing a second interior window. In this case the exterior window remains in place while a slider or hung window is installed within the same wall openings. Restaurants, schools, office businesses, and health care facilities use architectural acoustics to reduce noise for their customers. In the US, OSHA has requirements regulating the length of exposure of workers to certain levels of noise. Commercial businesses sometimes use soundproofing technology, especially when they are an open office design. There are many reasons why a business might implement soundproofing for their office. One of the biggest hindrances in worker productivity are the distracting noises that comes from people talking such as on the phone, or with their co-workers and boss. Noise soundproofing is important in mitigating people from losing their concentration and focus from their work project. It is also important to keep confidential conversations secure to the intended listeners. When trying to find places to install soundproofing, acoustic panels should be installed in office areas where lots of traffic corridors, circulation pathways, and open work areas are connected. Successful acoustic panel installations rely on three strategies and techniques to absorb sound, block sound transmission from one place to another, and cover and masking of the sound. Automotive soundproofing aims to decrease or eliminate the effects of exterior noise, primarily engine, exhaust and tire noise across a wide frequency range. When constructing a vehicle which includes soundproofing, a panel damping material is fitted which reduces the vibration of the vehicle's body panels when they are excited by one of the many high energy sound sources caused when the vehicle is in use. There are many complex noises created within vehicles which change with the driving environment and speed at which the vehicle travels. Significant noise reductions of up to 8 dB can be achieved by installing a combination of different types of materials. The automotive environment limits the thickness of materials that can be used, but combinations of dampers, barriers, and absorbers are common. Common materials include felt, foam, polyester, and Polypropylene blend materials. Waterproofing may be necessary based on materials used. Acoustic foam can be applied in different areas of a vehicle during manufacture to reduce cabin noise. Foams also have cost and performance advantages in installation since foam material can expand and fill cavities after application and also prevent leaks and some gases from entering the vehicle. Vehicle soundproofing can reduce wind, engine, road, and tire noise. Vehicle soundproofing can reduce sound inside a vehicle from five to 20 decibels. Since the early 1970s, it has become common practice in the United States and other industrialized countries to engineer noise barriers along major highways to protect adjacent residents from intruding roadway noise. The Federal Highway Administration (FHWA) in conjunction with State Highway Administration (SHA) adopted Federal Regulation (23 CFR 772) requiring each state to adopt their own policy in regards to abatement of highway traffic noise. Engineering techniques have been developed to predict an effective geometry for the noise barrier design in a particular real world situation. Noise barriers may be constructed of wood, masonry, earth or a combination thereof. One of the earliest noise barrier designs was in Arlington, Virginia adjacent to Interstate 66, stemming from interests expressed by the Arlington Coalition on Transportation. Possibly the earliest scientifically designed and published noise barrier construction was in Los Altos, California in 1970. ^ "Acoustics and sound insulation". zoomit. ^ Cox, Trevor J.; D'Antonio, Peter (2009-01-26). Acoustic absorbers and diffusers. ISBN 9780203893050. ^ "Low frequency absorption". Studio tips. ^ "Reflection, Refraction, and Diffraction". www.physicsclassroom.com. Retrieved 2017-07-10. ^ "Reduce Noise in your Home | Sound Control". soundcontroltech.com. Retrieved 2017-02-05. ^ "How to sound-proof your noisy apartment". Stuff. Retrieved 2017-02-05. ^ "Noise Control in Multi-Family Residential Buildings". Acoustical Surfaces. Retrieved 2017-07-10. ^ Camtion, Eros. "What is more effective between active noise cancellation and soundproofing ?". berkeley.edu. ^ Wisniewski, Mary. "City wants more Midway-area homeowners to sign up for soundproofing". chicagotribune.com. Retrieved 2017-02-05. ^ "U.S. Standards on Workplace Noise Trail Those of Other Countries". New York Times. ^ "Acoustic privacy considerations for open plan offices". Atkar. Retrieved 24 June 2016. ^ Neale, Paul. "How to reduce car noise". Car Insulation UK. CIUK. Retrieved 12 February 2015. ^ Neale, Paul. "Mr". Car Insulation UK. CIUK. ^ "Introduction to Car Audio: How to Tame That Road Noise". Secrets of Car Audio. ^ "DOW Automotive Systems: BETAFOAM™ acoustic foams" (PDF). dow.com. Retrieved 2017-05-26. ^ "Sound Barriers Guidelines - Highway Traffic Noise". roads.maryland.gov. Retrieved 2017-07-10.